If you are looking for my Sparkle Creations challenge post, please click here or scroll down. Thank you! Today is the final introduction of the new JustRite Stampers releases. You are in for a treat today as we are not only previewing a new cling set, but also a matching custom die set! CL-02110 Charmed Set - Cling is a set of 15 cling stamps that coordinate with JB-08960 JustRite Custom Charm Dies and all JustRite 1 5/8" centers. With those options, the possibilities are endless! During today's blog hop we are giving away Three Mystery Blog Candy Shopping Sprees --- which simply means along the hop we have hidden 3 shopping sprees --- the designers don't even know if they have the shopping spree! Here's what you will be eligible to win along the blog tour - a $100 JustRite Webstore Shopping Spree , a $75.00 JustRite Shopping Spree and a $50.00 JustRite Shopping Spree. Simply leave a little love on each blogger's post and on Friday Morning we will announce on the JustRite Blog the 3 Designers who have the mystery candy and the winners!! Comments will close at midnight CST on Thursday Evening. Complete hop list is near the end of this post. Good luck to you! I am going to interrupt my post here to show you how I cut my charms.. In the past, I have used my Cuttlebug with my die cuts, but thanks to Spellbinder's Paper Arts, I am the proud owner of a Grand Calibur (a HUGE thank you to the owners, Stacey and Jeff, for their incredible generosity!). This charm project is the perfect one to highlight its use. First, I started by stamping all of my charms on a sheet of cardstock, then I carefully placed each die over each charm (secured with a little bit of scotch tape). Once I was ready to cut, I placed the cutting plate on top and ran it through the machine and all 4 charms were instantly cut. I ran them through a second time to emboss the edges. The best part is that the cutting area is a generous 8 1/2" x 11", so you can cut much more than what I showed here. Below are my 4 charm dies ready to be added to my project. For more details, please visit the JustRite Inspiration blog for the official introduction of this set. Also, here is a list of my JustRite teammates hopping along with projects using Charmed and the Charm dies. You won't want to miss anyone for a chance to win some Mystery Blog Candy! 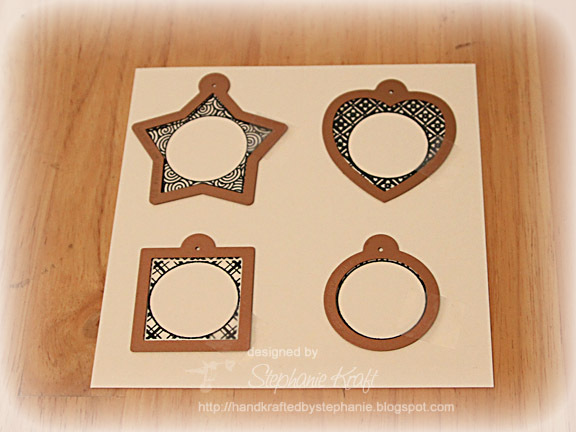 Accessories: JB-08960 Charm Dies (co-branded with Spellbinders), Standard Circle Nestabilities-SM, die 2, Big Scalloped Border Petite Borderabilities (Spellbinders); Black embossing powder, Twine (May Arts), Pearls (Kaisercraft), Seam binding, Button, Foam tape, Thread, Sewing machine. I especially love your tags. Black and white make outstanding projects. Thanks for the demo of the grand calabur. Love your tags...red & black are always so stunning. The\ tags look so pretty all lined up together! I love red, black and white together. I love your tags-thank you for the tutorial! It is so much easier for me to see someone demonstrate a technique rather than following a description. The tags are great! Your tutorial was very clear. Lovely card and tags. Love the colors that you chose. I love the color combination as well as having matching tags and cards. Great gift idea! One of my favorite color combos! Love seeing all of your tags, so cute and so fun! You lucky girl with your grand calibur! love the tags and card! Thanks for sharing, love the tags and card. Red, white and black, my favorite color combination! And, you made your card so sweet. I LOVE it! Thank for sharing. Loved the red bow on the star. You make it look so easy. Thanks for sharing. Loving this new set of dies and stamps! I SO want a grand caliber...even more now!! Love the color combination! And now you are making me REALLY want the Grand Caliber! I must say I appreciate your tutorial on how to use the dies in the Grand Calibur. I know it takes extra work in pulling it together (wink)! Great job!! Cute Cute Stephanie.. Love these colors and what cute little charms tags... going on the wish list :).. I am just loving these stamps and dies...all of your tags are wonderful! LOVE your red/white/black tags & matching card, Stephanie -- looks like you're all set for any gift-giving occasion that comes up! Just amazing how JustRite is so innovative in keeping all their sets relevant and useful! And the Spellbinders' coordinating dies are just the icing on the cake! What a great pairing -- pure LOVE!!! I LOVE all the tags!! I am always making goodies to share and the Baked with Love would be a great addition to my crafting supplies.I love it used with the heart die ! I love the charm gift tags, they are just too cute. stunning card, great use of colors and contrasting design paper. love how the charm adds charm to the card! Thanks for the visual on these two products working together. I'm a visual kind of gal and I do so appreciate the tutorial! These products are so beautiful together - great projects! Love your gift tags and card. Fabulous color combo - one of my favorites. Don't you just love your Grand Calibur. I know I love mine. Love the black and white. 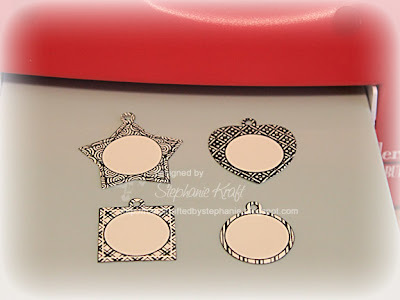 I could see me using these tag die and stamps, as I do a lot of baking and give it away. 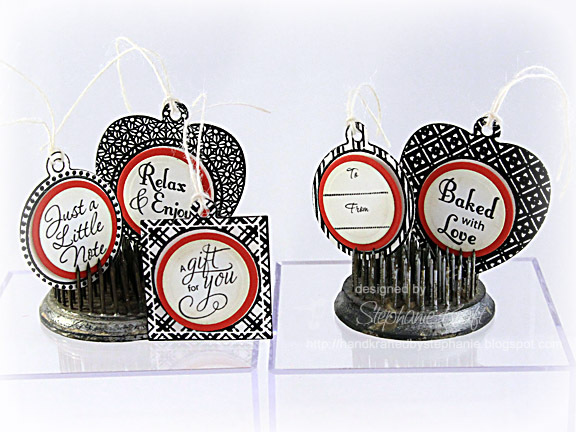 I love your choice of black and white with just a touch of red - makes these tags look so contemporary and elegant! Love the look of your elegant tags. Lovely card and charm tags too. Love the new stamp sets and dies too. Thanks for sharing. Great ideas...so creative and inspiring. Love the black and white and all the detail. Thanks for a chance to win! Really cute. I'm always rushing around at the last minute trying to make a tag. These charms are sooo cute. tfs. This is so lovely and inspiring!! Thank you for sharing your talent with us! Blessings! I love the little bow at the top of the tag! The red is a striking contrast to the black and white of the tags. Steph, your project is adorable! I love your stitched card! AWESOME! I love your colors and the paper! Great card & Tags!! Love the stamps & Dies!! Great post with lots of details. Love your tags and card! Thanks for showing the possibilities ! I am loving the black and red. Great projects!! what a great and elegant set- this would make a great gift. I love the colors and your project. Love the colors. Great job! I am really liking these tags, and can see myself using them alot. I like the papers with all the words, gives a very nice look. Nicely done...red, black, and white are such eye-openers! Good take on the colors and design! I love the way you displayed the tags. I keep coming up with all sorts of goodies to put these on. Love your card and tags. Great use of the colors. Wonderful idea to have these pretty labels cut and ready to go and your card is a beauty! Thanks for the inspiration.....I so want one of the new die cutting machines ....haven't made the journey down under yet!!!! wonderful projects! love the color combo. very envious of the large workspace on the grand calibur... thanks for sharing. Love all the tags and the beautiful card. Thank you for the info on using the dies with the caliber. Such a striking card! I love seeing these colours together and the tags look great! Beautiful! 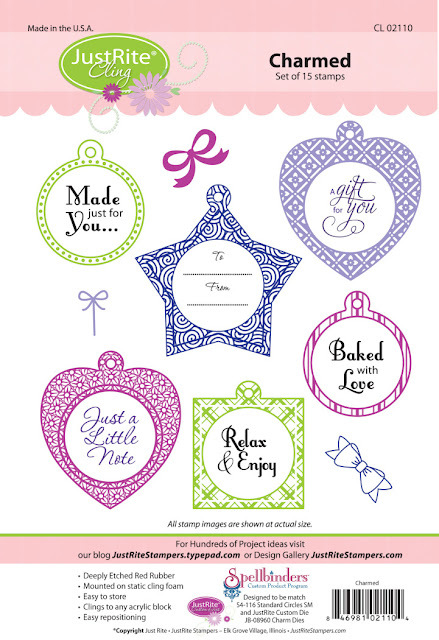 Cute tags and they are perfect for a gift. I love your tutorial. Very pretty card. Love the tags also. Balck & White with the red is a striking color combo. Love your tags. You can never have to many tag ideas!! Your tags are too cute, but your card is Fantastic! Love your colors and DP's. Thanks for sharing! Love, love, love your tags!!! My fav color combo. I already wanted the new charms dies and stamps when I saw the products, but now I gotta have them cause I so want to do these tags! Gorgeous!!! Stephanie, ALL of your projects are fabulous! Love the burst of red! Your tutorial is da bomb :) Thanks for the inspiration! Stephanie, what a fun card and tags! Love the color scheme. These dies would be fun to play with! Thanks for the inspiration! Oh my, I love your card and set of tags! The red and black is so striking. 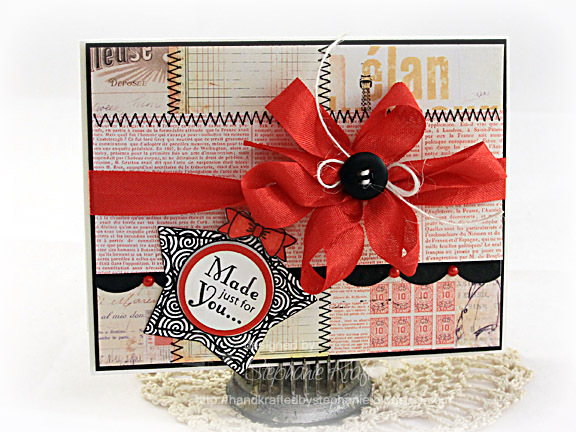 Wow - love the black and red, but you went way beyond and showed several tags, I now have tag envy :) Thank you also for the short tutorial on how you did this great work. What a fabulous bow! And those tags are great. Love how smart the black and red looks. This is so exciting. WOW! I love your card and it was helpful to see all the tag examples! I love this new Charmed Stamp set and these Charm dies! You lucky gal ~ a Grand Calibur. LOVE your card and gift tags. Tend to be partial to red, white & black but these are gorgeous. What a fun set of stamps and dies! Stephanie these tags are lovley they will brighten up anything and make any gift look a million dollars. I am so green with envy over your Grand Calibur. Saving my pennies like made to get one. Fun and cute tags and card! 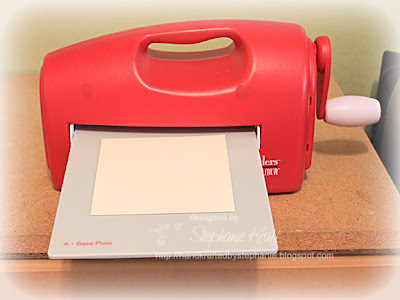 I love your tutorial for the grand calibur - isn't this the best tool for die cutting? I love mine, and am so glad that I made the investment! Thanks for showing us your tutorial! Love the card and matching gift tags. Love the color combination that you used. Love all of your tags, and you showed just how easy they are to use. =D The black, white and red layers just pops. Wonderful card and I love that you made extra tags for later use. Love the black and red. This set is amazing I love the little bow that comes with it. These images are so striking in black & white! Thank you for taking the time to show us how you created this...wonderful!! Beautiful card and and tag set! Love the red and black! So many fun things can be done with the new dies and charms! What a fun card and great tags! Thanks. Stunning card & tags! Color combo is awesome....I think that's what pops for me. 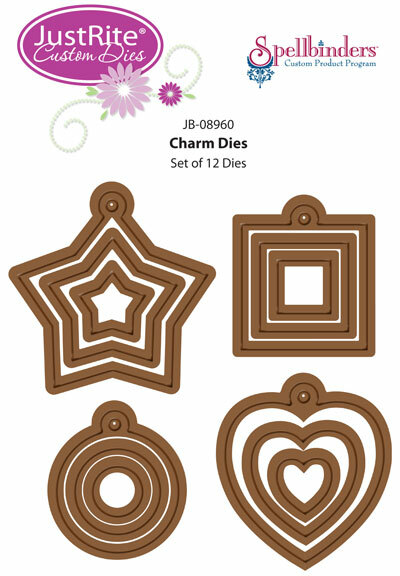 Loving these new Charmed Stamps & Dies!!!!! I have to get a Grand Calibur and this Charm die and stamp set. All these blog project are so inspirational. I love your card color combo and the tags, too. TFS. Love your combination of red black and white, and I'm loving these sets the more I see them! Hi Stephanie, I am loving your gorgeous card, love the ribbon and beautiful design. 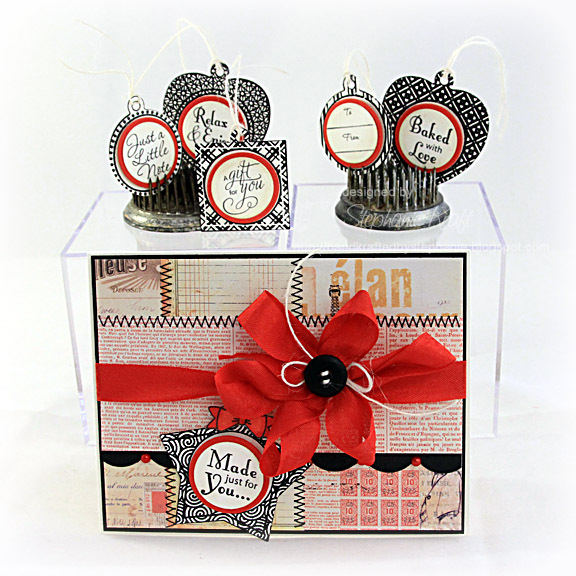 FAB use of the new stamps and dies, those little gift tags are so elegant and classy. Thanks for the inspiration. love that paper on yoru card! Fabulous card and the design is wonderful! The shapes are wonderful and love how you used them! Cute tags and card! Great blog hop! Love Just Rite products. You have done a great job showcasing these new products! Lovely work! Such a great color scheme! The pops of red are the perfect touch! Love your tags!! The new tag dies and matching stamps are wonderful!! All those tags are great! Love the dramatic colour combo. 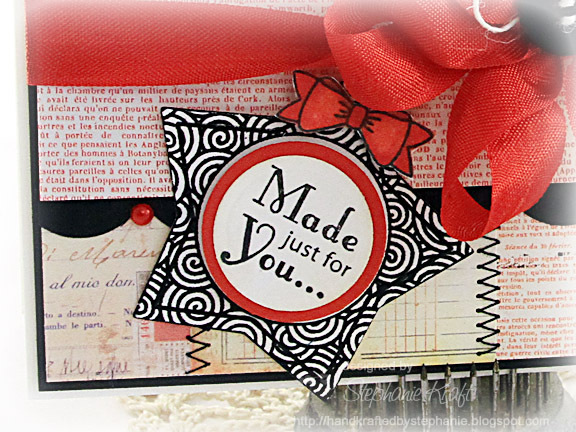 The black, white and red color combo makes these tags more than just a tag, something elegant! LOVE your tags and card!! Just beautiful! Love the design, and colors! Love the red, black and white color combo, so striking. And thanks for the step by step tutorial as well, always appreciate those. Thanks for going above and beyond to take the time to post that for us. Love the striking color combo...the tags and card are just beautiful! Wow!!! Really elegant card and tags. I love the boldness of your card! LOVE, LOVE, LOVE the color combo on these! Great card and wonderful tags! I like your bold color choice...very pretty tags! Thanks for the mini tutorial. Love your card color combo. Stephanie, all of your tags are amazing and I adore your card -- great colors! Lovely card. The colors are beautiful and love the stitching on the card. Thanks for sharing.